Klosters and Davos, the highest ski resorts in Europe. If you’re looking to go big, then a Klosters and Davos ski vacation is ideal. Boasting the largest ski resort in Switzerland and the highest city in Europe, Davos is comprised of five separate ski areas, any one of which would be considered big by American standards. The Parsenn cog rail bahn (chairlift), which rises out of Davos Dorf, has increased uphill speed and capacity, ensuring that this historically—since 1931—popular ski resort giant is never too crowded. Non-skiers and vacationers looking for plenty of off-mountain activities have ample choices. 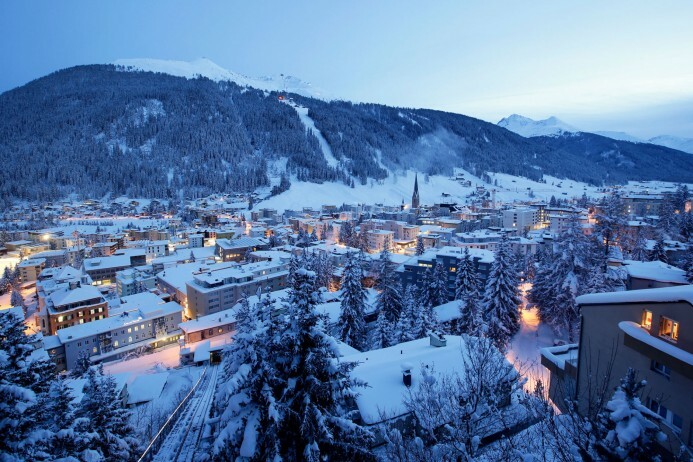 Cruise around Davos’ miles upon miles of cross-country trails, speed down its tobogganing hills, and relax with the family on a cheery sleigh ride. Ice skating and hockey enthusiasts will be wildly pleased to learn that Davos is home to a Europe’s largest outdoor rink. Klosters, the ski resort located down the road from Davos, is connected to the same ski circuit, making it easy to explore both villages during a Davos ski vacation. Smaller in size and quainter in nature, Klosters’ village offers a warm and picturesque surrounding for your après-ski activities: shopping, tennis, squash, sleigh rides, night life and cultural events.With five ski areas spread out on both sides of the valley and descents from almost 9,000 feet, Davos skiing offers the alpine skier an endless amount of terrain. Advanced to expert skiers and snowboarders are best served at Davos, and intermediates have a handful of good options; one, because there are technically no beginner runs, and two, because it requires a somewhat seasoned skier to navigate Davos’ never-ending expanse. Freestyle enthusiasts will be happy with Davos’ two terrain parks. First-time park riders all the way to professionals will enjoy Davos, but its Jakobshorn’s Jatz Park that will really get the adrenaline pumping. Jatz Park is also home to one of Europe’s largest superpipes. The closest airport for ease of access to Klosters and Davos is Samedan St. Moritz at 25 miles away. A 6 seat Cessna Citation CJ2 jet from London to Samedan St. Moritz is approximately 1 hour 35 minutes. A larger 8 seat Cessna Citation XLS will complete the journey in 1 hour 25 minutes. The Drive time will take approximately 1 hour 40 minutes. A helicopter will get you to the resort in 30-40 minutes. Arranging a private jet charter or helicopter transfer with Freedom Air to arrive in style to Davos and Klosters is simple. The Freedom Air team can be reached on +44 (0) 1275 548001 to book your next trip.